“Pink Out” days and basketball games at Milwaukee Public Schools’ Rufus King International Baccalaureate School – High School Campus are raising awareness and funds to battle breast cancer. On the “Pink Out” days, students wear pink to show their support. That includes basketball players, who sport tie-dye pink jerseys and pink socks. Rufus King students have already raised close to $3,000 for the cause over the past three years. The 4th-annual effort has already raised $1,000 from T-shirt sales, according to twin sister seniors Alexandra and Samantha Adams, who are leading the cause this year. The battle against cancer is a personal one for the sisters. Their father survived a bout with brain cancer. Their aunt fought breast cancer – and survived – twice. “It was really only when I sat down and thought about how much this illness has affected my family on both sides did I realize this is an important cause and we need to support it as much as we can,” Alexandra Adams said. She and her sister Samantha are taking on the project this year as part of the Creativity, Action and Service (CAS) component of the International Baccalaureate (IB) diploma they are pursuing at Rufus King. 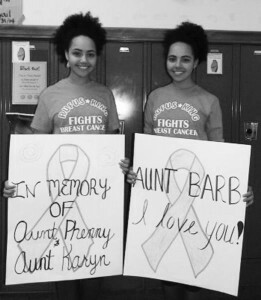 Along with about a dozen student volunteers, the Adams sisters are raising money by selling T-shirts and creating posters honoring those who have battled any cancer. Donations are also being collected at the games, with all funds going to the United Way aimed at supporting those impacted by breast cancer. Rufus King’s “Pink Out” started in response to a former staff member’s fight with breast cancer, in addition to the many students and staff in the school who have had loved ones impacted. “Pink Out” games are also a part of the schedule at other MPS schools, including Alexander Hamilton High School. MPS Superintendent Gregory Thornton and Rufus King High School Principal Jennifer Smith applauded the students’ efforts.